Harrisburg, PA – Today, Governor Tom Wolf launched the new PA Business One-Stop Shop to serve as a sole source to guide entrepreneurs and small businesses through all stages of development, from planning and startup to operation and expansion. Before the One-Stop Shop, a small business owner or entrepreneur would be required to seek out information from several different agencies and organizations throughout the planning, startup, and operation processes. The PA Business One-Stop Shop consolidates all of this information into one website, and any questions can be directed to a single phone number that provides one-on-one customer service by phone as well. The process for creating the PA Business One-Stop Shop was truly an interagency state government collaboration between the departments of State, Labor and Industry, Revenue, and the Office of Administration. To identify the needs of the business community, Wolf Administration officials held planning sessions and user testing with a wide variety of internal government and external stakeholders and partners to ensure different perspectives and input was received from communities and businesses across Pennsylvania. 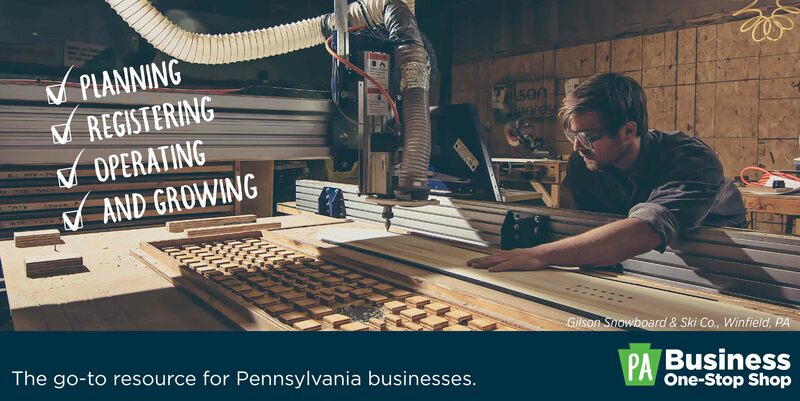 To keep up-to-date on small business activities in Pennsylvania, follow DCED on Twitter, LinkedIn, Facebook, and YouTube and use the hashtag #PASmallBiz to follow the conversation.